Awkward pro players make poor celebrities, but the LCS depends on them. Pro League of Legends has been rumbling on for years now. 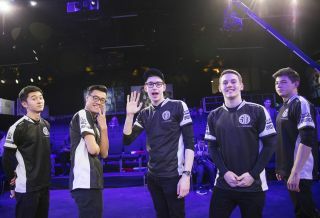 While we like to look back and reminisce on the early days, when Worlds was played in a nicely lit room with computers on a regular ol’ table, there’s no denying that the LCS has headed in a slicker, more traditional direction. Casters wear suits, players wear jerseys branded with sleek logos and sponsorships, every minute is filled with either some hype building music or professional, practiced banter. League of Legends has worked very hard to become something that you could show your mother with minimal embarrassment or confusion. There’s just one problem with this bold new direction: when marketing League of Legends, you have to look to the players. In the coming years, we’re likely going to see personal branding for players become one of the most talked about topics in all of esports. This is a conversation that goes beyond just benefitting pros and lining their pockets (although that’s undeniably important)—it permeates every level of pro League. Before we begin, I’d like to direct your attention to the following fan made video by Charlie Weierke. This takes place in February of 2015, where World Champion Piglet was replaced on Team Liquid by KEITHMCBRIEF (Now known as just Keith, on Echo Fox). It was a shocking switcharoo, and the video opens with some social media memery. Keith is well liked, and part of that is he’s willing to joke around. Our expectations lowered by Keith’s early ‘fk u all’, we lead into his success on Liquid. This montage manages to perfectly capture the production values, clarity, and general interest that a LCS broadcast boasts. And then we meet Keith. Keith takes a moment to thank all the Twitch chat people and memers, and then lets us all know that le toucan has arrived. It’s a comical clash between the LCS broadcast to, well, Keith, in his full (if a little awkward) glory. Players receive minimal (if any) training on how to deal with the media, and working on personal branding is currently more of an art than a science. Sometimes, players like Keith manage to capture fans’ attention by appealing to the humble memers out there. Other times, these attempts fall flat. There are, very occasionally, natural superstars who have charisma, the ability to handle an interview, and sometimes even good looks. Most of the time, however, players tend to be a little awkward, a little uncomfortable, and have to grow into the role of a public persona. First of all, it's becoming increasingly important for players to be able to maintain their personal brand and build that into something greater if they want their career to extend past esports. I recently wrote about how streaming is becoming an alternative to pro play, and you can’t stream with a livable level of success if you don’t work on your branding. For as much as Imaqtpie sticks to white t-shirts, a goofy grin, and yelling at Small Cat, there’s no denying that it's an effective brand that connects with people. This goes beyond just players, however. Fernando Cardente recently wrote about how the EU LCS is dying because the players aren’t able to connect with viewers. He writes: “[Europe’s lack of success] revolves around a blatant lack of charisma of the players. Europe has run out of heroes. [...] The legends that shaped the continent have disappeared from the landscape and the subsequent generations have been unable to fill the void.” In short, the guys you cared about have left for greener pasture or retired, and the guys who are left don’t interest you at all, so you don’t tune into the EU LCS. Lower viewer numbers and reduced interest has an impact on the entire scene. Fewer viewers means less money, which means less infrastructure, which means a weaker scene. Cardente argues that North America, on the other hand, has stars. There are certainly more charismatic players and interesting storylines on this side of the ocean—Immortals versus Echo Fox wasn’t a compelling matchup because it offered the most elite gameplay in the world, but because Riot convincingly sold Dardoch against Akkadian based off the strength of the players personalities. The point here is that awkward, stumbling, stammering players are a problem. When it’s just one guy, he’s going to have a problem finding a career once he retires, even if he’s fantastic on the Rift. (Faker may be the exception to this rule.) When it’s a league, or a team full of people you can’t market, that starts to have very dire implications for the greater ecosystem. Cardente cites Anthony Davis, a New Orleans Pelicans player, for his infamous unibrow. The unibrow may look odd, but it’s a memorable branding choice. This is esports—we can go weirder than a unibrow. While Cardente suggests that Europe has few heroes left to cheer for, the Unicorns of Love constantly bring in new fans due to their audacious, aggressively pink, shirtless and sparkly approach. Nearly every team has the same sort of lineup, the same sort of promo shots; they pose five guys in front of a camera and have them stare aggressively into the lens. Maybe one or two of them will sport a smirk. The problem is that this isn’t on the players. Eventually, the onus is going to fall on organizations. When teams deal with players, they’re going to have to start getting creative and really looking at how they can bring these opportunities to the surface. Remember the roster of NRG that picked up fan favourites like KiWiKiD and Quas? Very few people do, and it’s a real shame. Right now, it feels like players cycle out too fast and opportunities pass them by, and so no one has figured out the personal branding game in League... Except Imaqtpie, who watches us peasants from his golden throne, counting his millions. Perhaps one day, we will be able to make lightning strike again for the next generation of players.